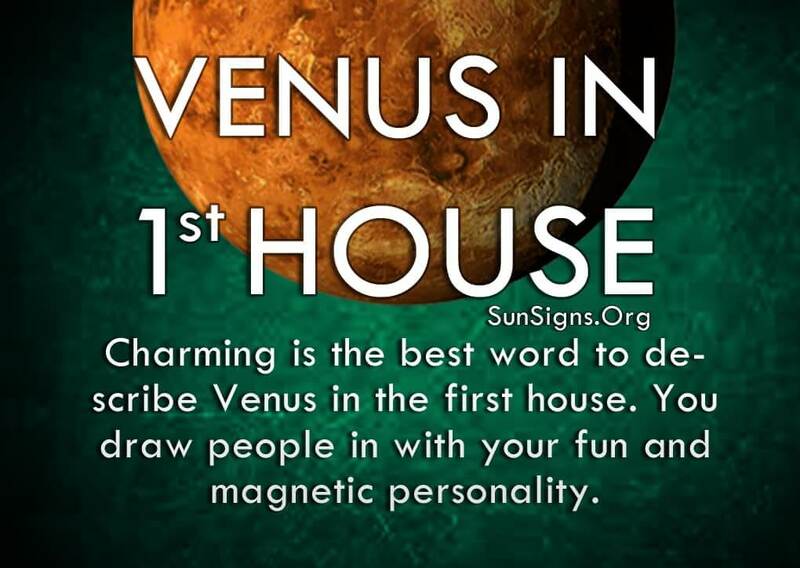 Charming is the best word to describe Venus in the first house. You draw people in with your fun and magnetic personality. You are at ease with who you are. People feel they know you immediately because you lay everything out on the table. This makes you quite attractive. Venus symbolizes love in a general sense, but also encompasses pleasure and the things that bring us joy. Because you like to be first in everything, Venus in the 1st house always makes a strong impression. You enjoy putting yourself out there and you aren’t afraid to go after what you want. This makes you an irresistible force, one that people are drawn to. It’s because you enjoy life in general, and you take each day as a new opportunity to do something fun and exciting. You appreciate the little things as much as the big things, and feel the need to experience as much as possible to lead a fully satisfying lifestyle. After all Aries is the ruling zodiac sign for this house. Because of your attractive personality the Venus in 1st house people find themselves surrounded by a large social circle. You love going out and having fun. That’s why you also enjoy being in a relationship. You get a rush from starting a new romantic relationship because everything is fresh and exciting. But you also need to be with someone who can go the distance with you. While dating around is fun and keeps things different and interesting, you do want to settle down with someone. Your loyalty and dedication to your friends and loved ones is fierce. You want to extend that to a lifetime partner. You have no trouble finding people attracted to you, so it’s more about finding the right fit. Venus in 1st house meaning predicts that you do have to be careful not to emit a false sense of bravado, though. There are times when you are unsure of yourself but you don’t want other people to know it. This is when you become passive-aggressive or pretend to have an idea what’s going on when you don’t. This can cause problems, especially when others are looking to you for answers. It’s okay to say, “I don’t know.” But you hate being vulnerable so you try to play it off as something else. You’re so consumed with wanting to be liked by everyone that you sometimes force a situation to be something it’s not. And if you’re unable to pull off the charade, this can turn people off more than if you were honest in the first place. You don’t like to beat around the bush. So use the same strategy when you don’t know what to do. People will still appreciate your honesty in that situation, maybe even more so. The Venus in 1st house astrology predicts that the only challenge for others is keeping up with you! But when you find someone who can do just that you know you’ve found a partner for life. It may take a while, and patience is not something you’re comfortable with! But take your time on this issue, and you will be much happier for it. Just be careful not to take over everything in the relationship once it becomes a long-term commitment. Or your partner may feel a bit blindsided by your sudden need for control. Maintain that flirtatious charm without going overboard, and you’ll remain an irresistible force for the rest of your life! What’s Your Soul Mate Sign?